It was an early start, as we had an 8 am train to catch. However, it was convenient to get down to the train station. We grabbed some sandwiches from a deli for breakfast and hopped on our first train of the day. I’d booked us on a Norway in a Nutshell tour, which isn’t a “tour” in the traditional sense with tour guides and a group that you follow around but simply arranged transport from one place to another. 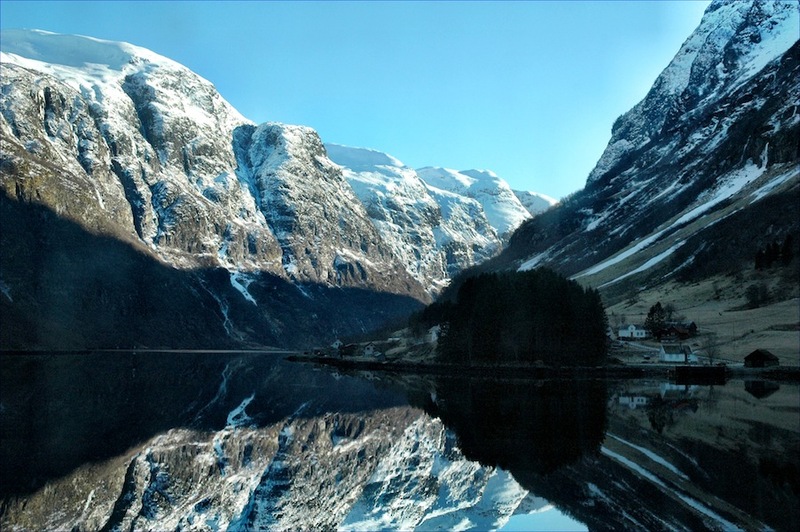 We spent about 4.5 hours on a train from Oslo to Myrdal, a relaxing ride through the countryside, passing colourful farm houses, frozen lakes and streams and through Hallingskarvet National Park–an expansive snow-covered plateau. There was an abundance of skiers on the train, primarily cross-country skiing, which wasn’t surprising when you saw the landscape. In Myrdal, we changed onto the Flåm Railway, which is apparently one of the world’s steepest railway lines, to take us to Flåm, on the innermost corner of Aurlandfjord. We grabbed a pair of seats, but most of our time was spent by the door taking photos through the window of the magnificent landscape as we wound our way through the valley. It was only an hour long train ride, and we soon pulled into Flåm for a couple of hours. We grabbed a bite to eat in the local tourist enclave before boarding our ferry boat that would take us from Flåm to Gudvangen on the Aurlandfjord and the Nærøyfjord, a narrow fjord only 500 metres wide in some parts. We boldly staked our claim on the top deck with provided plastic chairs, despite the cool temperatures, fully intending to tough it out. As the ferry got going and the breeze kicked up, however, it became untenable after a certain point (we did last longer than many other tourists). We ultimately retreated down to the heated cabin for short stints and then darted up to take photos until we got too cold. The scenery was truly breathtaking, particularly the Nærøyfjord–craggy, snow-covered mountains rising starkly from the fjord waters, with small villages dotting the coastline. D declared it to be the most beautiful natural landscape he may have ever seen. All in all, despite being cold, it was a pleasant 2 hour ride. We disembarked at Gudvangen and immediately boarded a waiting bus to take us to Voss. The sun was setting as we headed off to Voss and bathed the snowy landscape in a wonderful light to cap off our tour. From Voss, we boarded a train to take us to our final destination, Bergen, a small town on the west coast of Norway. The tour was definitely a once in a lifetime opportunity that I’m glad we didn’t pass up. Well worth it. It was dark in Bergen when we rolled in, around 8 pm. Thankfully, our hotel, City Box, was only a few blocks away from the train station, and we were able to find it and check-in without any problem. The room and facilities were spartan but comfortable and had all we needed for a brief stopover. We looked up the nearest grocery store and gathered supplies, including reindeer sausage, for our hotel room dinner. D was somewhat disappointed to have missed the cut-off for buying beer in stores (which is apparently 8 pm in Norway). This entry was posted in europe, norway, travel. Bookmark the permalink.